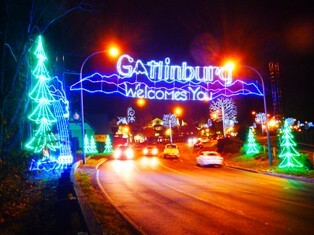 The Gatlinburg Christmas Trolley Ride of Lights is an amazing tour through the city of Gatlinburg. 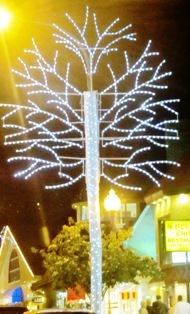 The town is all aglow with twinkling lights as designated trolleys make their journey. 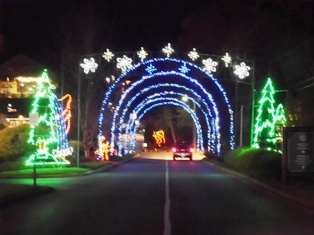 This monumental ride moves comfortably down the city's Parkway and adjacent Highway 321 as guests delight in brightly colored LED lighted displays! You'll become enchanted by sparkling fountains, colorful animals, shimmering trees, and more! Everyone of all ages love to take this magical ride, however, it's a special treat for children! Smiles appear on their bright little faces as they become wide-eyed with joy at the whimsical scenes that include the bear, deer, fox, rabbits, squirrels, and other mountainous creatures that come alive with color! The lighted Rocking Horse has been a favorite for most of the - more than 22 years - The Gatlinburg Christmas Trolley Ride of Lights has been in existence. 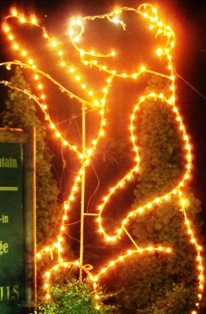 The Gatlinburg CHRISTMAS trolley ride of lights features displays of forests and wild animals all aglow! Visitors climb aboard a beautifully decorated trolley for an exciting 45-minute ride. This tour is filled with loads of interesting information about the city's decision to change the Gatlinburg Christmas Trolley of Lights lighting to LED bulbs. This was a move that now allows the city to light the more than 35 displays for four whole months for the same price they used to pay fort three days of electricity. (And that, my friends, is a Gatlinburg Green Fact!) 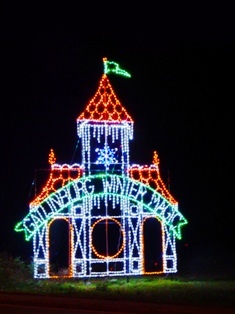 The Gatlinburg Christmas Trolley Tour of Lights has become popular and continues to grow as new displays are added. To take The Gatlinburg Christmas Trolley Ride of Lights tour, you must go to the mass transit center near Ripley's Aquarium of the Smokies at traffic light #5.. Boarding times are 6:30 P.M., 7:30 P.M, and 8:30 P.M. These tours begin in mid-November and last through the most part of January. However, Saturday evenings are the only time the January tours are available! All trolleys are enclosed, heated ,and travel one major route! Food and drinks are not permitted! Children 3 and under who sit on their parent's lap ride free! General admission for this tour is $5.00. There will be NO trolley rides on the day of Gatlinburg's annual "Fantasy of Lights" Christmas parade on December 7th!! Rides are also unavailable the first Friday in December, Christmas Eve, Christmas DAy, New Year's Eve, and New Year's Day. 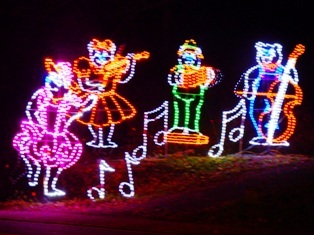 For more information about the Gatlinburg Winter Magic Trolley Ride of Lights, please call 1-800-588-1817.